Some sports (and professions) require athletes to switch quickly between strength-based and endurance-based tasks. One way to address this demand in training is to blur the lines between strength and conditioning. 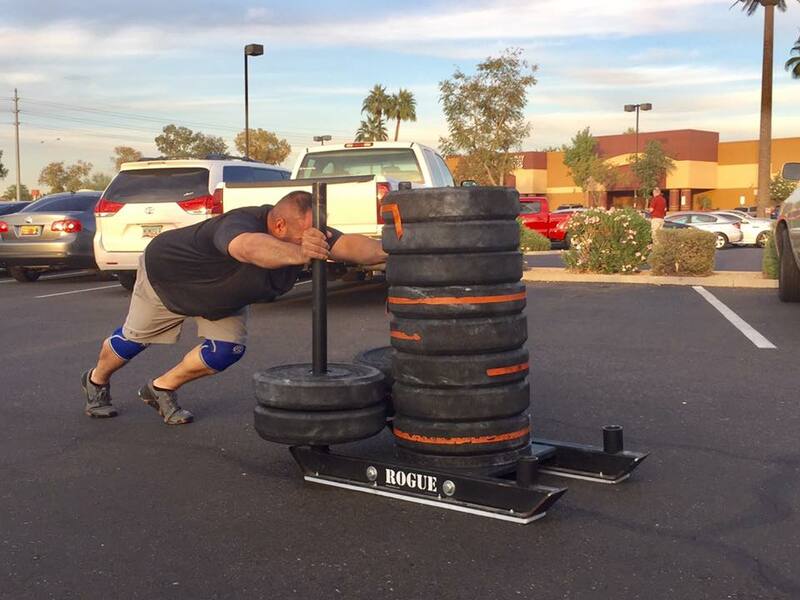 This can be accomplished by integrating the sled with running and/or other movements. 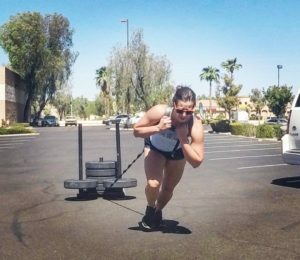 Shuttles are an efficient way to structure sled workouts. In the case that the workout calls for a 40yd Shuttle and an 80yd Shuttle, place a cone at 20yd and a cone at 40yd. By completing a shuttle (out and back) to the 20yd cone, you have completed a 40yd shuttle. By running to the 40yd cone and back, you have completed an 80yd shuttle. 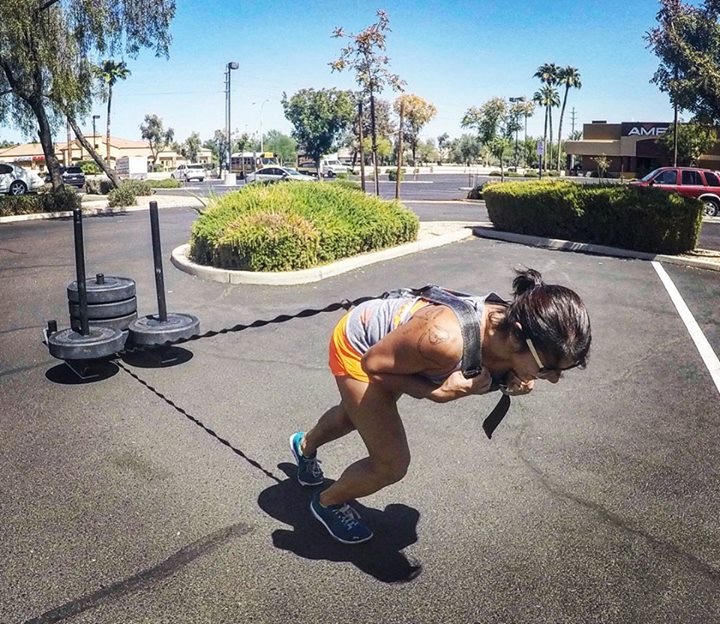 In this workout, you alternate between sled push shuttles and shuttle runs. The runs are twice as long as the sled push; this makes it so that the shuttle run concludes back at the sled. This workout is based on a 1:1 work:rest ratio, which can be accomplished by alternating rounds with a partner or timing your work and taking an equivalent rest. 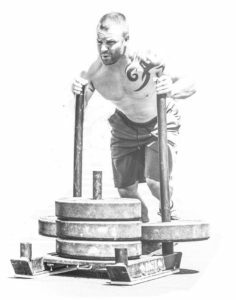 The effect of this workout can be changed based on the amount of weight used on the sled. A lighter sled will result in a faster workout, but may fail to achieve the strength stimulus of a heavier sled. Set your objective prior to beginning the workout and choose a weight that will allow you to accomplish that objective. 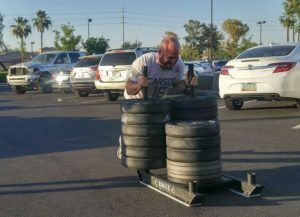 One example of selecting an objective would be: “to complete the workout without walking while pushing the sled.” It’s not unusual to be able to run the sled for the first portion of the workout and then break down to a walk. 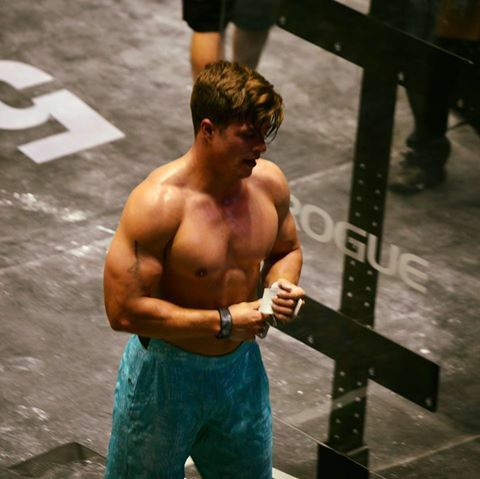 This isn’t necessarily a bad thing; you’re still placing significant stress on your cardiovascular system, and this type training can be useful practice for completing heavy work under fatigue or for having to run after completing strength work. There are an infinite number of ways to structure the work when combining the sled with running. The following is similar to the above workout, but with an emphasis on covering more ground, largely through more running. You can make things even more interesting by including a third element: calisthenics! Don’t forget to include the rower! This is another animal entirely. The focus shifts toward speed, which creates greater demand for recovery between efforts. Sprinting with the sled can also be rougher on your body than slower pushing. By increasing the speed, we are recreating much of the impact and force that occurs when sprinting. 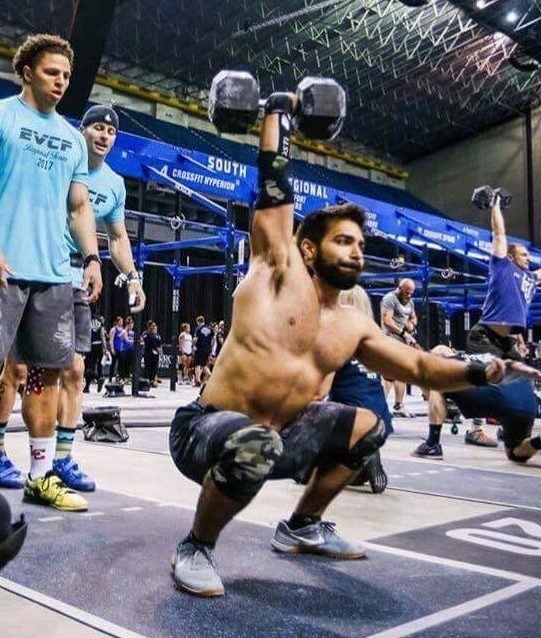 This type of training will typically lead to some soreness, and will have more impact on the athlete’s ability to train at a high intensity in the near future. The use of sleds for speed training is rapidly gaining popularity. This is particularly true for field sports that involve significant contact. There are two primary reasons behind this increase in popularity. 1. Sleds keep the athlete in the “Drive Phase” of a sprint. 2. Sleds are great for increasing the capacity to generate horizontal force. 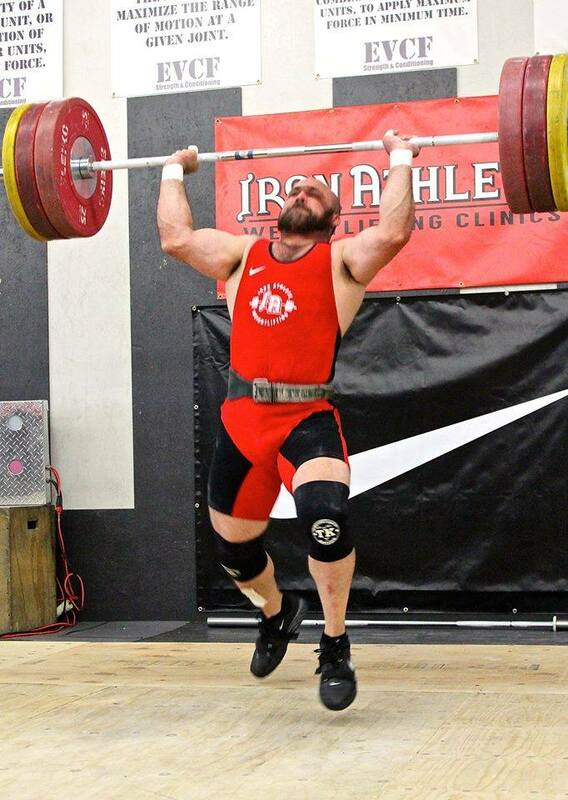 Training to develop strength by generating vertical force does translate into an increased ability to generate horizontal force, but it is probably not as efficient as training by exerting force in the horizontal plane. The load used in a sled speed workout can be looked at in two ways. the dogma of train fast be fast, train slow be slow. This is the traditional view and is often being disregarded by many sports performance coaches. and oft-neglected component of speed. Allow full recovery between efforts. Speed is The Priority. Relays are an efficient way to manage large groups of athletes. It is vital that we respect the time of the athletes that we coach. It is not acceptable to waste their time due to a lack of creativity or a lack of planning. For example, you have 5 sleds and 25 athletes to run through a training session. The least-efficient way to manage the training session would be to have one athlete working on a sled at a time. That would mean that one athlete would complete 5x40yd, (rest 3:00), 4x40yd (rest 3:00), 3x40yd, (rest 3:00), 2x40yd, (rest 3:00). This would require each athlete to have a sled for approximately 26:00. It is much more efficient to run the sprints as a relay. With 5 athletes on a team, the athletes will get nearly the same amount of recovery as they would running by themselves. Running sprints as a relay also elicits greater effort from most athletes due to the tendency of the relays to become races.